This is easyexcelmacros.com. This site provides you with free tips and hints which will make developing your own macros in Excel VBA easy. How can I add a new line IN A MESSAGE BOX? You can use vbCrLf. vbCrLf stands for VB Carriage Return Line Feed. MsgBox "Line 1" & vbCrLf & "Line 2"
It puts a return and a new line as shown in the message box below. how can I get the sheet names of an Excel file? In order to display all the sheet names of an excel file we need to know how many sheets the excel file contains. In Excel VBA we can use the for each..next loop for this. How can I delay a macro? To wait a certain amount of time before executing the macro use this simple code. How can I automatically run a macro? If you want a macro to run automatically when opening your workbook you can use the Workbook_Open event. In your visual basic editor, click on ThisWorkBook. From the left dropdown list choose workbook and from the right drop down list choose open. 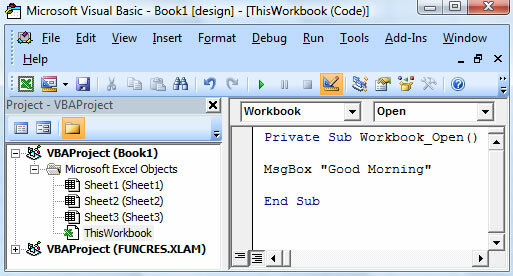 Save your macro and open the workbook and a message box saying Good Morning should appear. how can I disable errors showing up in Excel vba? The following code line will allow Excel VBA to continue the next code line upon hitting an error. As a result the incorrect code line will be ignored and only a value of 2 will be placed into Cell A1. How can I select a range from the active cell to the last entry in a column or a row? To select a range from the active cell tot the last entry in a column or a row use the following VBA code. You can use xlToLeft, xlUp and xlDown for the other directions. how can I manipulate text using Excel vba? To extracts the leftmost characters from a string use left. To extracts the rightmost characters from a string use right. To extract a substring starting in the middle of a string use Mid. how can I halt an infinite loop? When we execute the following code in Excel VBA it will never stop. It never stops because the part after Do While never becomes false. x will always stay higher than 2. To halt this infinite loop in Excel VBA simply press Ctrl + Break.